I’m a Philadelphia Union fan. Please don’t ask me why, because I am totally confused about what to think of this club. 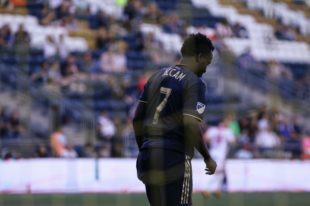 David Accam comes on board. Yay! We have the goal-scoring Achilles we’ve been begging for. So far, his goals-per-minute-played-on-roster production has been eclipsed by Jay Simpson. Sad. Anyone who is remotely familiar with this team’s roster knew we needed a playmaker since July ‘17. So of course, Earnie Stewart waited until the last minute of preseason to bring on an injured Borek Dockal, whose fitness and learning curves contributed to early confusion in a rudderless offensive scheme; which in turn sacrificed most of the easy points in the U’s early season schedule. The agonizingly slow start was absolutely predictable and therefore preventable. Yet the Oracle of AZ (Alkmaar, that is) could not conjure anything better during the offseason. C.J. Sapong comes off a Homeric year and promptly goes into a scoring funk deeper than the Pit of Despair. Haris Medunjanin has started to show that he is less than a Titan, and Alejandro Bedoya is, well… Bedoya. So it’s fallen to Fafa Picault, Ilsinho, Corey Burke and an awakening Dockal to search for the golden fleece. The big gamble was supposed to be the teen movement on defense. They wind up fighting like Greeks out of a wooden horse – stalwarts, with Trusty looking like a future captain. And both Keegan Rosenberry and Ray Gaddis come on strong. Figure out that inconceivable convergence. Jim Curtin, forced more by fate than guile to rotate his squad, puts something resembling a lossless streak together and dares tempt the soccer gods by pondering “What if…?” And Earnie is tempted to jump ship, wooed by the Siren song of U.S. Soccer, endangering the success of his 5-year Odyssey. Then comes Atlanta and a ref with the vision of an astigmatic Cyclops and a temperament to match. And in spite of all the research done on that sorry excuse of an arbiter, two of our greatest champions dared to bait the beast – and lost. Forced by circumstances to stay home, I was really looking forward to watching the Open Cup game against Richmond on live stream. So of course, the stream doesn’t work. And of course, the streams for the concurrent New England and D.C. United games work just fine. It’s all just so Union. Why am I cursed with the desire to watch this team? I revere the founders of the Sons of Ben, who made it possible for me to call the Union “My Team.” Greatness, or at least a playoff game or two, may yet reward their Herculean efforts. Yet I long for the upstart spirit of Cincinnati, with its superior fan base and community support, not to mention its Union exiles. Nothing the Union accomplish ever happens on purpose. This club, as far as we know, may have a Plan. It may have a Vision, or a Mission Statement. It may even have a Philosophy (probably reductio ad absurdum). Yet nothing is really happening on purpose. With this club, there’s no such thing as a sure thing. In fact, much of the time there is no such thing as a thing at all. Maybe that’s why I’m still a Union fan. The U is a mystery, wrapped in a conundrum, stuffed into an enigma and encased in a myth. And I’m in its invidious thrall. I blame the Eagles, Sixers, and Phillies for becoming too good too quickly. All of that would have made sense and belonged in the history of Philadelphia sports. And the Union would have assumed their place alongside the less-than-mediocre teams this city has long produced. But alas…the other teams had to go and, you know…get good and stuff. And now the U look like the confusing mess they truly are. The Union had from like 2012-2016 to solidify a foothold in the Philly sports scene – when the other 4 teams were basically garbage or close to it. Instead, they made no MLS playoffs, made two US Open Finals (lost both AT HOME), and averaged a 14th overall place finish in MLS during that time. I am a founding member and supporter for life, cause I love the sport and the team, but the Union had a golden opportunity to be a true option for folks to get into… and they blew it. To me, the other teams getting good now, is just the nail in the coffin – for the average fan that is. My attempt at humor was to note that all Philadelphia sports teams are typically bad, with occasional moments of adequacy. So, they U being bad-to-average while the other teams were crap was pretty much standard Philly Sports Fare. But there was apparently a meeting and the other teams decided they would be good…and they didn’t invite the Union to join them on the parades. Desh have to do it. sorry. truth though and people argue moisty moisty hot collar hot collar these are just words. words have meaning. not a club. FULL STOP. if the players would like to discuss themselves as club, can argue okay but for desh and jason, joe fan, tread stone on the outside of a single entity this this this franchise model- not a club. so stop please i get hot hot hot and transform. some here argue otherwise. some here will say, desh at it again. desh and union hulk make me moisty dropping truth bombs next to mo peds to blow blow cars.. but we have to learn and i have to teach teachy…boom boom. “my team” yes! my teamy. I’d argue that 5 homegrown players (almost all on the field together) playing in a game from the first real class we have ever had. All looking like they, at a bare minimum, belong was done on purpose. That is what this team is. That’s the plan. That’s the philosophy. And interchanging parts all coming in and absolutely crushing a lower level squad (which will translate to being a good MLS squad once the current youth are the vets) is the vision. No argument on the club definition. But then why, Desh, does my franchise have only the $1 menu, no free refills and it closes early? Why do the other franchises have McFrappucinos and McAngusBurger Deluxes? Is there one owner or no? Guess not all MARKETs are created equal. Maybe Earnie’s exit will be the Holy Hand Grenade! Nice work Matt. Loved it.